Directed by Najeeb Mirza, 2008, 74 minutes. 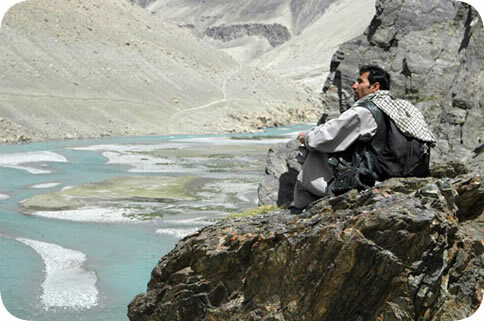 Study areas: South Asian Studies, Afghanistan. The Sweetest Embrace is a well-intentioned film which shows the human side of the turbulence and warfare afflicting late twentieth and early twenty-first century Afghanistan. During the struggle between the Soviet Union and the mujahadeen in the 1980s, two families in Northeast Afghanistan sent their two young sons across the border to Tajikistan to escape the war and to be educated. The collapse of the Soviet Union and the ensuing civil war in Tajikistan in the 1990s compelled the two boys to flee once again this time to Russia. Eventually, Canada granted them asylum. By 2008, the two have grown up and conceive of a return to their native land. As one of them remarks, they have been “abandoned by their country” and “forgotten by everybody.” One expresses an even greater stimulus for their journey, saying “Without family, how can I know who I am?” They travel with a team of filmmakers to try to find their parents and relatives. Once in Kabul, they begin their journey to Northeast Afghanistan, crossing deserts, enduring sandstorms, driving on treacherous high-altitude roads, and passing through some of the world’s loftiest mountains. “Roads” is doubtless an exaggeration, for their car traverses open land and then over rocky terrain. Frustrated drivers repeatedly contend with flat tires, and the last one gives up and returns to his native village, leaving the two young men with a dangerous three day hike through snowcapped mountains before they reach one destination. Violence intrudes again and again. They pass burned out tanks and cars, point to bullet holes in a school one of them attended, and have to stop for several days in a town en route because of unsettled and unsafe conditions. Both men eventually reach their separate villages. One has a moving reunion with his mother, father, and siblings. Despite all the hardships and conflicts they had endured, his relatives prepare a feast and entertainment. He does not marry the girl to whom he had been affianced as a child. His traveling companion learns from his grandfather of the awful fate that had befallen his parents. Both men return to Canada. They have been changed by their exposure to other societies and lifestyles, and they also say that they can send money to their relatives. The Sweetest Embrace is a welcome addition to the visual materials about Afghanistan, but its defects ought not to be ignored. The scenes of the beautiful but also occasionally desolate and impenetrable landscape are vivid. Yet the movie is slow moving and repetitive, and one-quarter of the film could readily have been deleted. The lead character’s English is garbled and often impossible to understand. There is no attempt to provide background for much about modern Afghanistan. Nor is there any explanation of the conflicts and the politics of the country. Social patterns are not explored. The filmmakers’ only concern appears to be the story of the two young men without providing much context. The Sweetest Embrace could be used, with appropriate backgrounding by the instructor, in upper-level high school and freshman college courses on Modern Asia or International Politics. Morris Rossabi is Distinguished Prof of History at City University of New York and Adjunct Prof of History at Columbia University. He is the author of numerous books, including Khubilai Khan, The Mongols and Global History, and, most recently, Voyager from Xanadu. The Sweetest Embrace: Return to Afghanistan is distrubuted in the U.S. by The National Film Board of Canada. Includes public performance rights. Only available in the US and Canada. > China: Empire of Art?